Home » Gosselin Sextuplets Turn Five! The Gosselin Sextuplets turn 5 today! These famous pre-schoolers have come along way since their amazing birth. On May 10th 2004 at 30 weeks gestation Kate delivered the babies at Penn State Milton S. Hershey Medical Center in Hershey, Pennsylvania. All six arrived via a Caesarean section within a span of three minutes with more than fifty doctors, nurses, and other specialists involved. Since the sextuplets were born in Hershey, they were called “Hershey Kisses” by the nurses and doctors who delivered them. 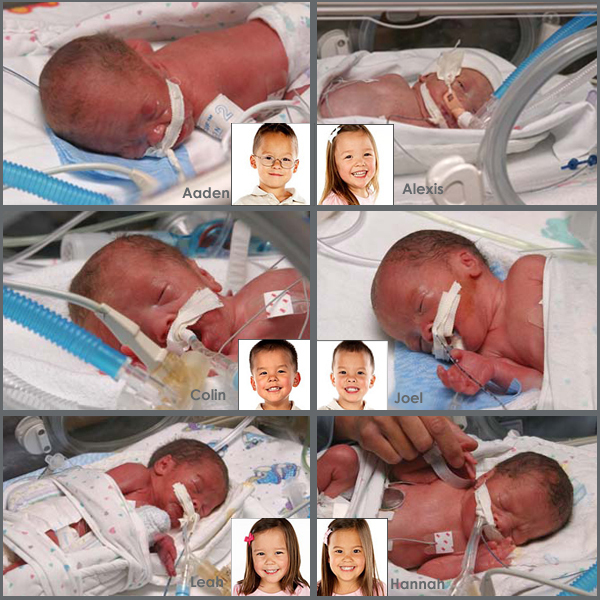 At the time the Gosselin sextuplets were the seventh set of sextuplets born in the U.S.
Tobey Maguire and Wife Jennifer Meyer Welcome Baby Boy! Im 15 years old , and I watch every single episode of your show, I love it soo much and your kids are just so cute. I wish I could meet them. I love kids, my friends are here with me and love your show aswell . I hope your show never ends so i can see your kids grow up. Kate, You are a good mom. Anyone who has twins and then 6 more kids the same age has to be a gifted person. You are very talented and organized. I have 2 toddlers and at times its hard. But I love being a mom its the best. You are doing the best you can!! Love the gosselin kids ! there show is amazing i can watch it for hours !! kate is a great mom ! !